The commitment of Haringey council and Tottenham's traders to the regeneration of the High Road following the events of August 2011 has been greatly encouraging, although it may sometimes seem that every positive step forward is accompanied by an adverse step back -- for example, the rebuilding and extension of White Hart Lane station by TfL on the one hand but, on the other, the loss of several heritage buildings as part of the redevelopment and enlargement of Tottenham Hotspur's stadium. 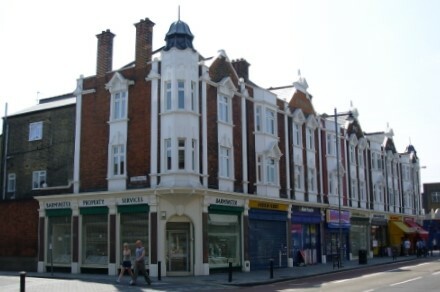 Nevertheless, the photograph to the right of the restored facade, including the shop fronts, of the Windsor Parade at 538-554 High Road, constructed in 1907, shows what can be done if the will is there. We hope that visitors to this website -- members of the Society, visitors to Tottenham, internet surfers in general -- will enjoy these pages as both a source of information and a useful resource for discovering more about Tottenham beyond the way it is sometimes reported in the media. You can contact us at any time by e-mailing TCS at tottenhamcivicsociety dot org dot uk.